*1 Also compatible with DSA8200, TDS/CSA8200, TDS/CSA8000B, and TDS/CSA8000 sampling oscilloscopes. As clock speeds and rise times of digital circuits increase, interconnect signal integrity dramatically affects digital system performance. Accurate and efficient analysis of the interconnects in time and frequency domains is critical to predict signal losses, jitter, crosstalk, reflections and ringing, digital bit errors, and eye-diagram degradation, and ensure reliable system operation. IConnect® software is the efficient, easy to use, and cost-effective solution for measurement-based performance evaluation of gigabit interconnect links and devices, including signal integrity analysis, impedance, S-parameter, and eye-diagram tests and fault isolation. With the help of IConnect and the built-in IConnect Linear Simulator, you can complete interconnect analysis tasks in minutes instead of days, resulting in faster system design time and lower design costs. 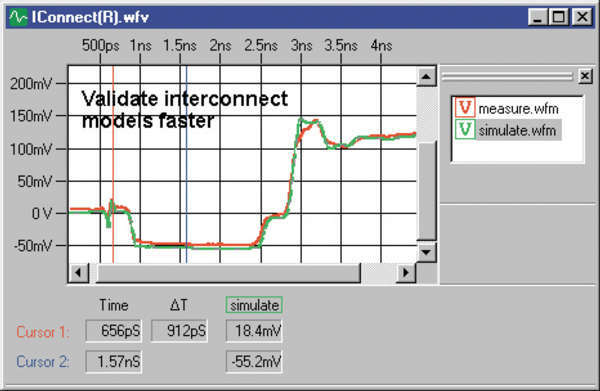 IConnect® S-parameters is the efficient and easy-to-use tool for digital designers, operating at gigabit speeds, to perform single-ended, differential, and mixed-mode S-parameter measurements of interconnects, measure insertion loss, return loss, and frequency-domain crosstalk, and conduct interconnect electrical standard compliance testing. Operating on the DSA8300 TDR platform, IConnect S-parameters is the most cost-effective and highest throughput approach for S-parameter measurements in digital design, signal integrity analysis, and interconnect compliance testing. It provides as much as a 50% cost savings compared to similar bandwidth VNAs, and dramatically speeds up measurements. You can also take advantage of the IConnect S-parameters command-line interface to add S-parameter measurements to the overall suite of manufacturing tests you perform using your TDR instrument. The simplicity of S-parameter calibration using a reference (open, short, or through) and an optional 50 Ω load make the measurement itself, fixture de-embedding, and moving the reference plane a snap. Calibration simplicity minimizes human errors during the measurement. Touchstone file format output enables easy S-parameter file sharing for further data analysis and simulations. With the addition of the IConnect® S-parameter Wizard, calibration and acquisition of one to four-port single-ended and differential S-parameters is even easier. This “mini-application” guides the user through setup, calibration (including channel deskew) and acquisition of S-parameters and automatically generates Touchstone files for one or multiple DUTs. Tektronix offers several true differential TDR modules, which in combination with IConnect allow S-parameters measurements with up to –70 dB of dynamic range. This performance is suitable for serial data analysis, digital design, and signal integrity applications, resolving better than 1% (–40 dB) of crosstalk, and electrical compliance test masks that typically call for the measurements in the –10 to –30 dB range. The table below summarizes the performance characteristics of these true differential TDR modules. Adding a wider-bandwidth module on the receiver end (e.g., using an 80E09 as a receiver with an 80E10 as a stimulus) will ensure the highest bandwidth for insertion loss measurements. With the long record length acquisitions, IConnect® provides great flexibility for obtaining the desired frequency range and frequency step when performing S-parameter measurements. Up to 1,000,000 points can be acquired. IConnect software allows you to quickly and easily generate SPICE and IBIS models for your PCBs, flexboards, connectors, cables, packages, sockets, and I/O buffer inputs directly from TDR/T or VNA S-parameter measurements. IConnect allows you to rapidly analyze eye-diagram degradation, jitter, loss, crosstalk, reflections, and ringing in your digital system. IConnect Linear Simulator allows you to link several interconnect components together to evaluate the total time, frequency-domain performance, and eye diagram of the overall channel. IConnect® substantially simplifies the signal integrity analysis of the interconnect link, equalization and emphasis component design, and analysis of the interconnect link with transmitter and receiver. IConnect provides the capability to quickly and easily compute your package, socket, and connector L and C using either the JEDEC or IBIS industry-standard computation procedure, the IConnect MeasureXtractor automatic modeling tool, or additional differential and single-ended TDR modeling procedures. To measure the input or output capacitance of the IC I/O buffer, the same modeling procedures can be applied. These JEDEC L and C measurements can also be automated in manufacturing using the IConnect command line interface. IConnect® offers the fastest, most cost-effective eye mask, insertion and return loss, and frequency-domain crosstalk specification compliance testing. Impedance, time domain, and S-parameter compliance testing can be performed in manufacturing using the IConnect command-line interface. Eye mask testing allows you to include the effects of crosstalk on the eye. In addition, IConnect has the capability to easily extract models that include skin effect and dielectric loss, insertion and return loss, eye-diagram degradation, and frequency-dependent RLGC parameters, and analyze the effect of equalization and pre-emphasis on cable assembly performance. Backplane and motherboard designers can analyze the signal integrity performance of their board, connector, and package interconnects in detail, or predict the eye-diagram degradation in the interconnects due to frequency-dependent transmission line losses and crosstalk using either the built-in links to SPICE simulators, or the IConnect Linear Simulator. MeasureXtractor is an automated model extraction tool, allowing you to obtain an accurate measurement-based SPICE model of the interconnect, with the press of a button. MeasureXtractor will guide you through the data acquisition process, help you acquire TDR/T or VNA S-parameter data, and will automatically produce an accurate model that matches both the time and frequency response of your interconnect. Losses, dispersion, jitter, crosstalk, reflections, and ringing are predicted accurately, up to the highest frequency of operation of your instrument. Passivity of models must be explicitly enforced during model extraction, and MeasureXtractor model passivity is assured through proprietary algorithms. This means that interconnect models generated with MeasureXtractor™ will not artificially amplify the signal, oscillate, or produce noncausal results when used in system-level simulations. MeasureXtractor produces what is known as a behavioral model. Such a model does not take into account the actual topology of the interconnect, but instead accurately represents the time and frequency behavior of the interconnect in the most simulation-efficient manner; in the case of MeasureXtractor with the minimum number of components and with guaranteed passivity. IConnect® TDR and S-parameter software provides you with an integrated simulate-and-compare link between SPICE simulators, and TDR or S-parameter measurements, allowing you to quickly validate models produced by IConnect or by outside tools, such as field solvers. You can validate your own models for your board-trace, package, or connector, or the models provided by your vendor. The whole design can be validated using an external SPICE simulator or IConnect Linear Simulator, ensuring that your design works reliably and the eye diagram is within specifications. IConnect® software uses an impedance deconvolution (Z-Line) algorithm, which further enhances the impedance computation feature in the DSA8300. The Z-Line algorithm efficiently takes care of multiple reflections in the TDR impedance measurement and produces the True Impedance Profile. As a result, you can measure PCB trace impedance more accurately and improve correlation of your data between measurements, including the correlation between such measurements performed by your coworkers or customers in another part of the world. The True Impedance Profile produced by IConnect Z-Line allows you to improve not only the TDR oscilloscope impedance measurement accuracy, but also to increase the TDR oscilloscope resolution. The EZ Z-Line user interface, providing single-button Z-Line computation for any number of waveforms, and enabling easy waveform manipulation and analysis, makes TDR data much easier to interpret. TDR is a reliable nondestructive approach for locating the position of failures in BGA and similar packages and printed circuit boards. 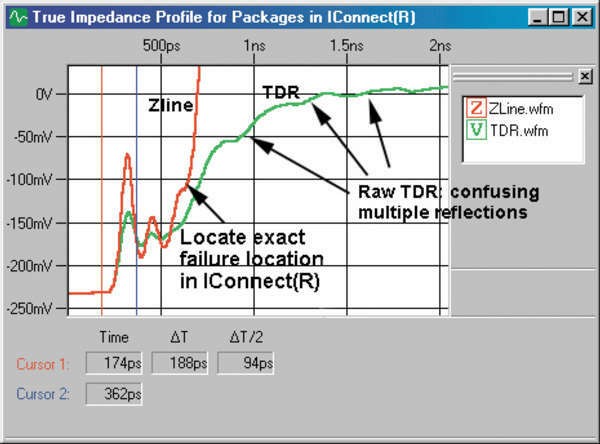 IConnect software Z-Line algorithm improves the resolution of TDR, facilitating easier location of open and short faults. When IConnect Z-Line algorithm is used with the 80E10 TDR module with 12 ps incident TDR rise time it enables sub-millimeter resolution for package and on-chip failure analysis. IConnect® EZ Z-Line user interface is specifically designed with a failure analyst in mind, providing single-button Z-Line computation for any number of waveforms, and quick and easy comparison between known good device traces and pins and suspect devices. This makes the TDR data much easier to interpret. Finding the location of open faults and signal-to-ground shorts becomes a simple task, and finding location of plane-to-plane shorts, signal-to-signal shorts, resistive shorts, and faults in fan-outs become realistic tasks. IConnect® S-parameter and Z-Line software. Includes: First year of maintenance and support from date of purchase. IConnect® Signal Integrity TDR and S-parameter Software. Includes: First year of maintenance and support from date of purchase. 80SICON includes all 80SSPAR functionality. IConnect® and MeasureXtractor™ Signal Integrity TDR and S-parameter Software. 80SICMX includes all 80SICON functionality plus MeasureXtractor (also includes all 80SSPAR functionality). *2 Also available as an option on the DSA8300 sampling oscilloscope. See the DSA8300 data sheet for more information. Tektronix recommends using quality high-performance interconnect cables with these high-bandwidth products in order to minimize measurement degradation and variations. The W.L. Gore & Associates' cable assemblies, accessible at www.gore.com/tektronix, are compatible with the 2.92 mm, 2.4 mm, and 1.85 mm connector interface of the 80Exx modules. Assemblies can be ordered by contacting Gore. To facilitate S-parameter measurements with these electrical modules and IConnect software, we recommend precision calibration kits, adapter kits, connector savers, airlines, torque wrenches, and connector gauges from Maury Microwave. These components, accessible at www.maurymw.com/tektronix.htm, are compatible with the 2.92 mm, 2.4 mm, and 1.85 mm connector interface of the 80Exx modules. Cal kits and other components can be ordered by contacting Maury Microwave.